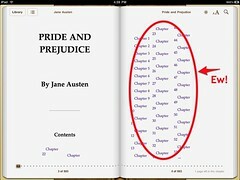 I hate it that iTunes won't let me see the free, public domain eBooks that I've downloaded through the iBookstore. They simply don't appear in my Books section in iTunes. I wanted to see what was causing it, so I had to go to Project Gutenberg, download the ePub there, copy it to the iPad to confirm it was exactly the same file (yup! ), and then open it up. The problem is that the three columns of Chapter numbers were formatted as a table, and though there is plenty of room for the contents, iBooks smushes the cells together anyway. I opened up a book of poetry and cried for page breaks. All the books I've downloaded from the iBookstore and from Feedbooks open on page 3, 5, or 6 the first time, and not on page 1. In addition, page 1 is on the left instead of the right. I'm unimpressed with Smashwords' conversion process. It is so automated that the results are practically unreadable. In the books I downloaded, there was no TOC and there was way too much spacing between paragraphs. It's just now how I want to read. Liza Daly over at ThreePress says that links in Feedbooks in iBooks go to Safari and then end up with an error. When I click a link in a Feedbooks book, Safari asks me if I want to download the file and open it in Stanza (which I had installed already). I looked around to see if there was a way to change the default program for opening ePubs but couldn't find one. 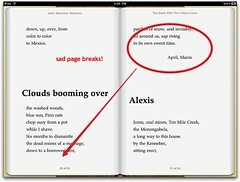 Strange that the iPad would opt for Stanza over iBooks. In the Winnie the Pooh sample, there is text that wraps around an image at the beginning of each chapter. I'd like to know how to do that. When you drag an ePub to iTunes, it first adds the iTunesMetadata.plist to the ePub file itself (as Liza points out), and then makes a copy of it and adds it to your iTunes folder inside the Music folder. As usual, if you change the metadata (with Get Info), the names of the files and folders change accordingly. You can only browse a tiny fraction of the free titles in the iBookstore. If you want to browse all of the Gutenberg titles, you can go to its site, find the title you want, and then jump back to the iBookstore and use the Search bar to find the title. They really are in there. I found a Catalan translation of Twelfth Night (La festa dels reis), which did not appear in the Featured section of the iBookstore but did appear after a search. And all of the accented characters display just fine, as expected.